ChessKid's Newest Feature: Puzzle Duel! Building off of the massive success of Chess.com's "Puzzle Rush" feature, ChessKid.com recently released "Puzzle Duel" in beta. The exciting feature, which is only available on ChessKid.com, allows kids to race each other in a real-time puzzle race. You can think of it as the "live" or "fast" chess server for puzzles! ChessKids can access the Puzzle Duel feature directly from their home page (the feature is only available on the website at the moment; it will come to iOS and Android devices later). Once in the puzzle war room, a ChessKid only has to click the orange "Play" button and then wait for a match! Both ChessKids will receive the same puzzles in the same order. You can request a direct matchup with any clubmates or friends by clicking the "friend" icon at top right of Puzzle Duel screen (adult users can only match with other adults or children they supervise). Most puzzles will be one-move tactics, like checkmates, free pieces, forks, and pins. In the case of both ChessKids having a high puzzle rating, then two-move puzzles will be introduced. A correct answer fills the ChessKid's power meter +2 while an incorrect answer reduces the power meter by -1. A ChessKid getting to +10 wins the match by "explosion." If neither player explodes the power meter, whoever is ahead at the end of two minutes wins the duel. FunMasterMike is about to fill up his power meter for an explosion! Check out the world’s first International @ChessKidcom Puzzle Duel Championship between FunMasterMike and GM Marc Arnold at the 2019 NY State Scholastic Championships. Real chess players don’t need chairs. Puzzle Duel will also be one-third of a team's score in the inaugural ChessKid Games, coming June 1. 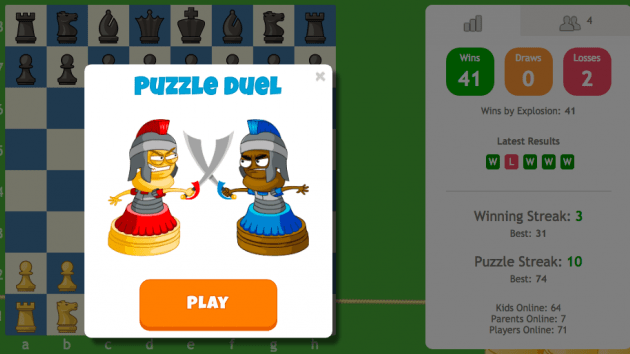 Head on over the ChessKid to try out Puzzle Duel today! Speed Chess Championship: The Final 4 Footrace!